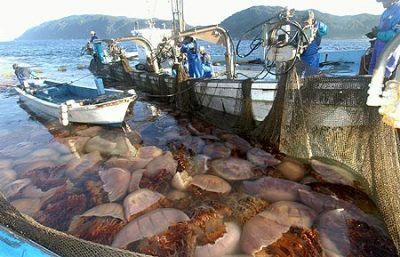 Every few years, a shift in warm currents to the north brings swarms of giant jellyfish called "Echizen Kurage " or Nomura's jellyfish into prime Japanese fishing grounds. The monstrous critters can be more than 6 feet in diameter and weigh up to 440 pounds, and when netted in quantity can destroy fishing nets and equipment worth thousands of dollars. To quote fisheries federation spokesman Noriyuki Kani, "It's a terrible problem. They're like aliens!" The situation has driven fisherman to find some way of deriving some economic benefit from the jellyfish, such as using them to make ice cream. It wouldn't be the first time a seafood flavored ice cream has been foisted upon the palates of Japanese consumers who seemingly have seen it all. 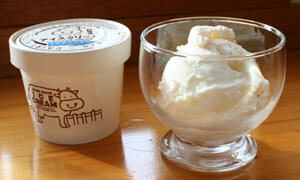 Crab, Clam, Eel, Fish and Octopus flavored ice creams have all appeared on store shelves at one time or another. Hmm, where did the kids go? This time though, manufacturers may have breached the limit of tolerance, and they know it: Jellyfish Ice Cream is being sold exclusively over the Internet by Rakuten in hopes of luring the novelty crowd. Another venue is the Kamo Aquarium in Yamagata Prefecture, where cooked Echizen Jellyfish is already on the menu. Guess they needed a dessert item - or something to threaten the kiddies with if they didn't eat their vegetables. "More peas, please!" Dumb? It's all in the eye of the beholder, isn't it? American county fairs and festivals serve up garlic ice cream, jalapeno pepper jelly and so on. It's not just about selling a product, it's about drawing attention to a cause. Take a look at that fishing net... those people have a BIG problem. I agree with Steve. I saw a show on jellyfish a couple weeks ago. 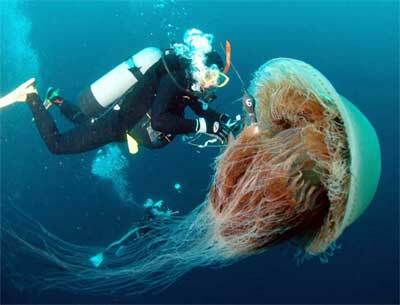 These jellyfish appear by the millions by even a small climate change. If you attempt to kill them, they release tons of eggs (females anyways) and a small climate change can trigger the birth of them. Fishermen don't know what to do. The jellies are killing off most of the fish. What would you do, hmm? Atleast they're being creative. I've had black pepper Gellato and enjoy expanding my horizons! !